Mac synchronization, sync Mac, synchronize Mac, Mac sync software, Android Mac sync, Google sync Mac, iCloud sync Mac, Dropbox sync Mac, iPhone sync Mac, mac Business and Office 365 Home accounts), other Macs, Google, Dropbox and iCloud accounts, any mounted storage devices, MTP devices. Improved: compatibility with macOS 10.14. 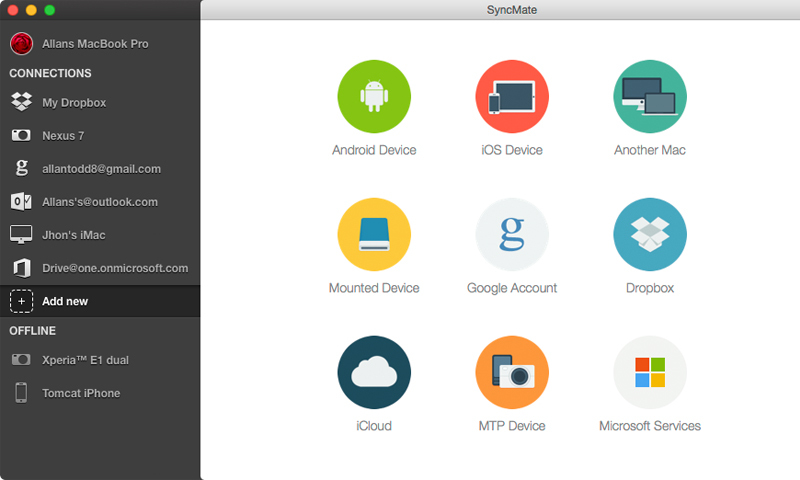 Improved: syncing with Google accounts. Improved: audio and video files conversion. Fixed: the issue with text messages not shown correctly on iOS 11 and 12. Fixed: incorrect time settings for calendar events after syncing with Windows services (Outlook online account, Office 365 Home and Business Editions). Other fixes and improvements (thank you for your continued feedback! ).